Richard of St. Laurence states "there is not such powerful help in any name, nor is there any other name given to men, after that of Jesus, from which so much salvation is poured forth upon men as from the name of Mary." He continues, "that the devout invocation of this sweet and holy name leads to the acquisition of superabundant graces in this life, and a very high degree of glory in the next." The Abbot Francone, speaking on this subject, says, "there is no other name after that of the Son, in heaven or on earth, whence pious minds derive so much grace, hope, and sweetness." After the most sacred name of Jesus, the name of Mary is so rich in every good thing, that on earth and in heaven there is no other from which devout souls receive so much grace, hope, and sweetness. Hence Richard of St. Laurence "encourages sinners to have recourse to this great name," because it alone will suffice to cure them of all their evils; and "there is no disorder, however malignant, that does not immediately yield to the power of the name of Mary." The Blessed Raymond Jordano says, "that however hardened and diffident a heart may be, the name of this most Blessed Virgin has such efficacy, that if it is only pronounced that heart will be wonderfully softened." Moreover, it is well known, and is daily experienced by the clients of Mary, that her powerful name gives the particular strength necessary to overcome temptations against purity. In fine, "thy name, O Mother of God, is filled with divine graces and blessings," as St. Methodius says. So much so, that St. Bonaventure declares, "that thy name, O Mary, cannot be pronounced without bringing some grace to him who does so devoutly." . . . grant, O Lady, that we may often remember to name thee with love and confidence; for this practice either shows the possession of divine grace, or else is a pledge that we shall soon recover it. On the other hand, Thomas a Kempis affirms "that the devils fear the Queen of heaven to such a degree, that only on hearing her great name pronounced, they fly from him who does so as from a burning fire." The Blessed Virgin herself revealed to St. Bridget "that there is not on earth a sinner, however devoid he may be of the love of God, from whom the devil is not obliged immediately to fly, if he invokes her holy name with a determination to repent." On another occasion she repeated the same thing to the saint, saying, "that all the devils venerate and fear her name to such a degree, that on hearing it they immediately loosen the claws with which they hold the soul captive." Our Blessed Lady also told St. Bridget, "that in the same way as the rebel angels fly from sinners who invoke the name of Mary, so also do the good angels approach nearer to just souls who pronounce her name with devotion." Consoling indeed are the promises of help made by Jesus Christ to those who have devotion to the name of Mary; for one day in the hearing of St. Bridget, He promised His most holy Mother that He would grant three special graces to those who invoke that holy name with confidence: first, that He would grant them perfect sorrow for their sins; secondly, that their crimes should be atoned for; and, thirdly, that He would give them strength to attain perfection, and at length the glory of paradise. And then our Divine Savior added: "For thy words, O My Mother, are so sweet and agreeable to Me, that I cannot deny what thou askest." St. Ephrem goes so far as to say, "that the name of Mary is the key of the gates of heaven," in the hands of those who devoutly invoke it. And thus it is not without reason that St. Bonaventure says "that Mary is the salvation of all who call upon her." "O most sweet name! 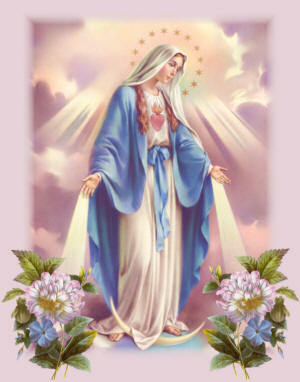 O Mary, what must thou thyself be, since thy name alone is thus amiable and gracious," exclaims Blessed Henry Suso. Let us, therefore, always take advantage of the beautiful advice given us by St. Bernard, in these words: "In dangers, in perplexities, in doubtful cases, think of Mary, call on Mary; let her not leave thy lips; let her not depart from thy heart." In every danger of forfeiting divine grace, we should think of Mary, and invoke her name, together with that of Jesus; FOR THESE TWO NAMES ALWAYS GO TOGETHER. O, then, never let us permit these two most sweet names to leave our hearts, or be off our lips; for they will give us strength not only not to yield, but to conquer all our temptations. "The invocation of the sacred names of Jesus and Mary," says Thomas a Kempis, "is a short prayer which is as sweet to the mind, and as powerful to protect those who use it against the enemies of their salvation, as it is easy to remember." Thus we see that the most holy name of Mary is sweet indeed to her clients during life, on account of the very great graces that she obtains for them. But sweeter still will it be to them in death, on account of the tranquil and holy end that it will insure them. Let us then, O devout reader, beg God to grant us, that at death the name of Mary may be the last word on our lips. This was the prayer of St. Germanus: "May the last movement of my tongue be to pronounce the name of the Mother of God;" O sweet, O safe is that death which is accompanied and protected by so saying a name; for God only grants the grace of invoking it to those whom He is about to save. Father Sertorius Caputo, of the Society of Jesus, exhorted all who assist the dying frequently to pronounce the name of Mary; for this name of life and hope, when repeated at the hour of death, suffices to put the devils to flight, and to comfort such persons in their sufferings. "Blessed is the man who loves thy name, O Mary" exclaims St. Bonaventure. "Yes, truly blessed is he who loves thy sweet name, O Mother of God! for," he continues, "thy name is so glorious and admirable, that no one who remembers it has any fears at the hour of death." Such is its power, that none of those who invoke it at the hour of death fear the assaults of their enemies.